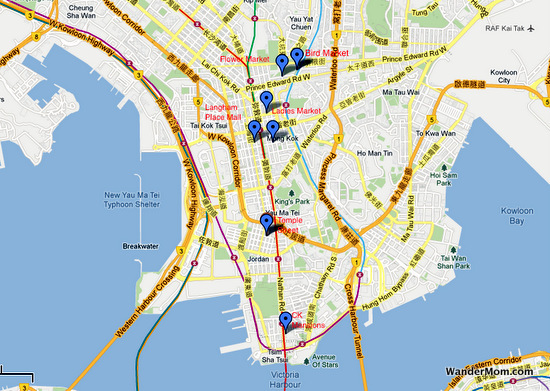 This is a map of the Hong Kong markets we visited on a Sunday wander. 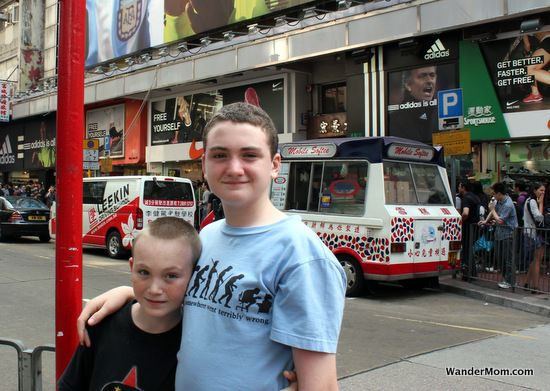 We hadn’t come to Hong Kong to shop but since a number of Hong Kong’s famous street markets were right on our doorstep in Kowloon – and because that kind of meandering day is our favorite way to explore a new city – it was an easy sell to CAM and BigB. We started at the market furthest away, the Flower Market, and spent the day working our way back down towards the end of Nathan Road. This is me reciting “Chrysanthemum, Chrysanthemum, Chrysanthemum” to BigB and him pretending that no, he never, ever liked a story about a little girl with such an elaborate name. Ever. 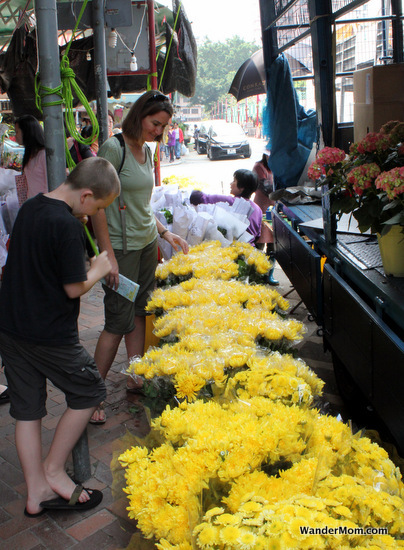 The Bird Market is only a couple of blocks from the Flower Market. 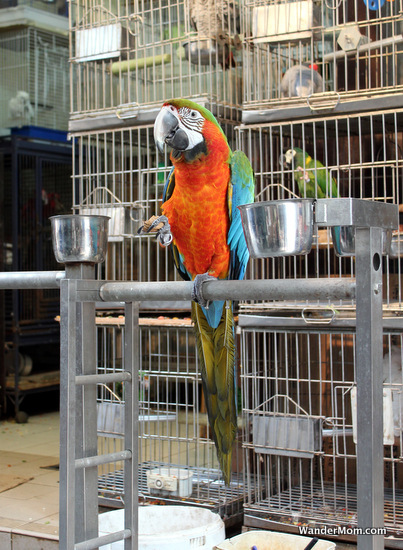 All of the stalls had bird cages stacked roof to floor and many cages had what looked like way too many birds in them. Space, apparently is at a premium even for Hong Kongs’ avian residents. Between the calls of the stall owners and the many birds cawing, squawing and even attempting to speak this market was an auditory assault, the very definition of raucous you might even say. And it was smelly, chicken-coop smelly. What? you didn’t know that chickens have some of the smelliest manure known to man? Well, now you do. And all those beautiful birds with colorful feathers? Just as smelly as your common-or-garden chicken. 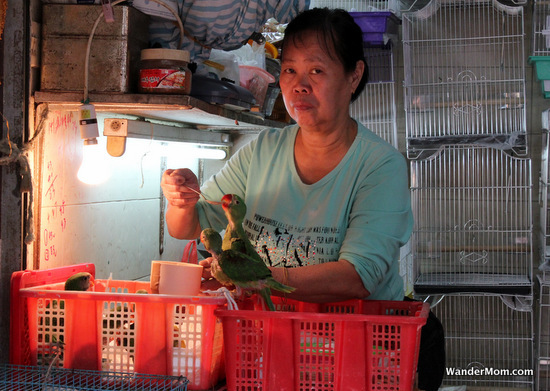 CAM and BigB lost interest in the birds – or were too grossed out by the smell – pretty quickly so we made to leave, but not before we caught sight of this stall-owner hand-feeding some baby parrots. Too cute. 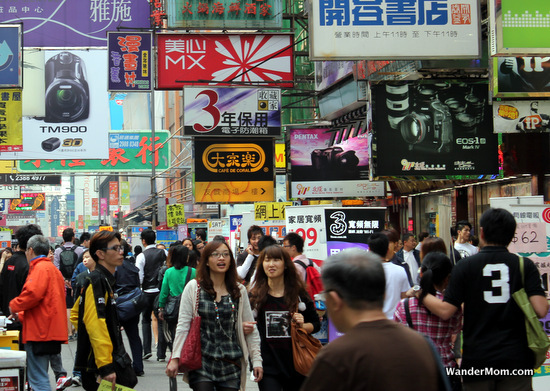 We went looking for lunch at the top of Tung Choi Street (Ladies’ Market). It turns out that this far up into Kowloon english menus are not de rigeur, who’d have thunk? We managed to do OK for our first experience of point-and-guess ordering in a chinese restaurant. Sated, we resumed our meander through the markets. Honestly, at this point I was just about coming to terms with the immense volume of people on the streets. So this was China, eh? Murph and I regressed to playing our favorite “How many Irelands could you fit in this place?” game. With the population of HK at just over 7 million and Dublin a paltry 1 million, no wonder these streets were feeling crowded to me. Our boys, urban to the core, surrounded by familiar logos and with stores selling either electronics or sporting goods within reach on both sides of the street were in their happy place. We had to bail before making our way through all of Ladies’ Market. A combination of just too much and your classic “bathroom, now” cry from one of our kid tourists. We detoured to the Langham Mall simply because it was nearby, not realizing that we were entering a Hong Kong shopping mecca. With 15 floors of modern shopping nirvana, it took us a while to find the bathrooms and by then BigB had also discovered the “Spiral” on the top four floors. The walkways in this section of the mall corkscrew around the steep Xpresscalators. I thought we wouldn’t be able to find out way out. Our last stop of the day was the Temple Street Market. You may think I’m making fun when I say that this Chinatown beats all other Chinatowns in the world hands-down. I’m not. 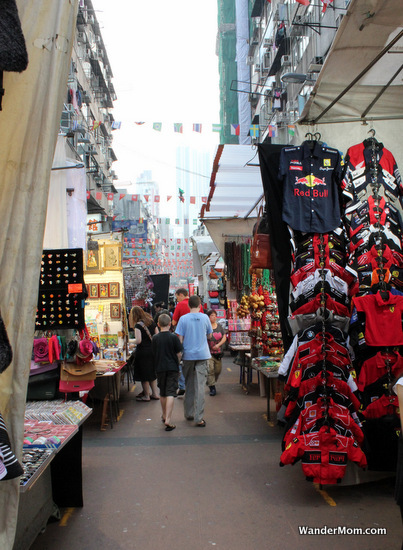 It’s huge and crowded with every single bit of tourist kitsch you’ve ever imagined on sale. 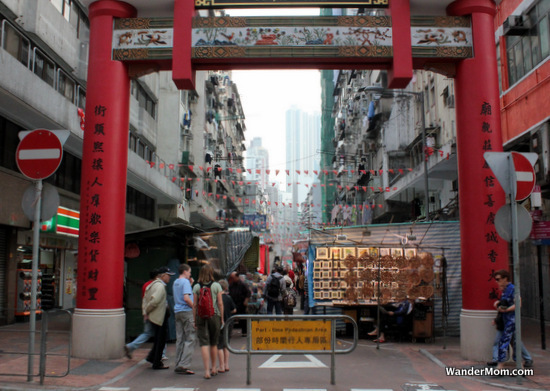 This entry was posted in Hong Kong and tagged Hong Kong, Kowloon, Markets, Shopping on July 16, 2012 by wandermom.